The winner of Sister Celluloid Contest #2 is Kathy McC! This time, the prize was 10 classic film cards from the company that made them best: Garbaty of Germany. 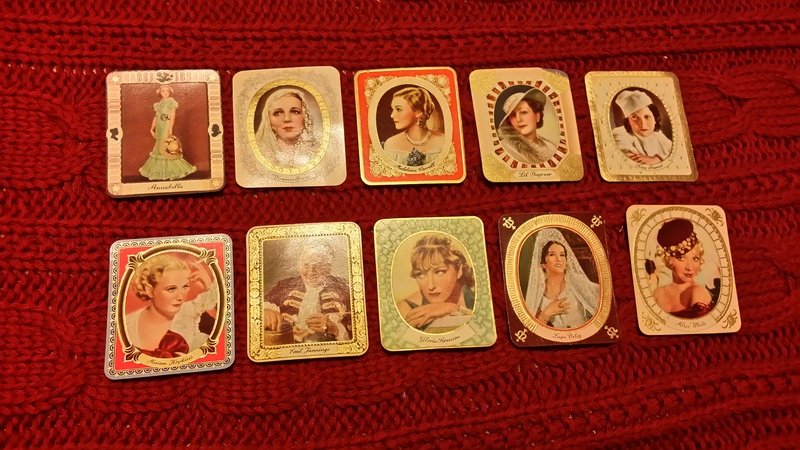 All of these cards are from the 1934 “Modern Beauty” series; the stars are Annabella, Virginia Bruce, Madeleine Carroll, Lil Dagover, Kay Francis, Miriam Hopkins, Emil Jannings, Gloria Swanson, Lupe Velez and Alice White. And all that fabulousness will now be winging its way to Kathy. Congratulations, girl! Keep an eye out for Sister Celluloid Contest #3, coming up soon. And a huge thank-you, as always, to everyone who stops by to read, share and comment! I’m so happy you’re here! Awesome! I would like to thank the Academy for … wait, I’d like to think the fabulous Sister Celluloid for being generous and awesome. 😀 Who loves ya baby!? Oh my God did you know it was Telly Savalas’s birthday when you said that?!? Love you back! !